For Sharon's website, see Sharon's Creature Village. 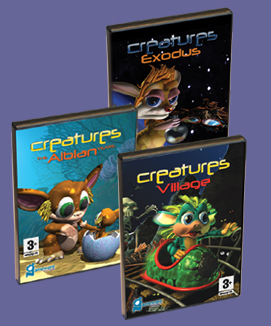 You will need the Creatures Remastered Patch to make this game work with addon packs designed for previous games. 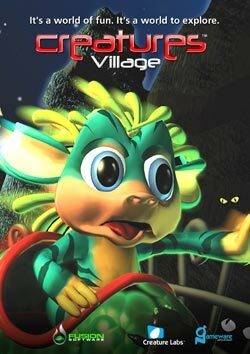 For some reason the recompiled version of Creatures Village lacks both parental controls and ingame music. The music can be enabled, however, by running the program in Windows 98 compatibility mode and pressing CTRL+SHIFT+DELETE whilst the program is loading. There is currently no known way to enable the parental controls. 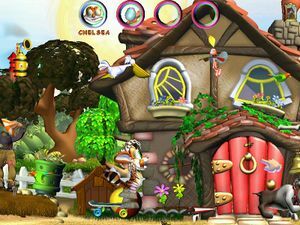 Creatures Village is also the name given to the single game produced when both the original Creatures Adventures and Creatures Playground games are installed on the same computer and the Merger is run. The resulting world combines the rooms and norn breeds from both of the games as well as unlocking a selection of extra rooms and breeds which are not otherwise available. This page was last modified on 2 April 2019, at 17:30.